At Options everything we do is about putting people first - whether that be delivering exceptional care and support for our clients, or providing growth and development opportunities for our team. The list contains all of our current vacancies. If any are of interest, please contact us for further details and quote the reference number of the vacancies we have in the field. If you would prefer to download a job application form, please click here. 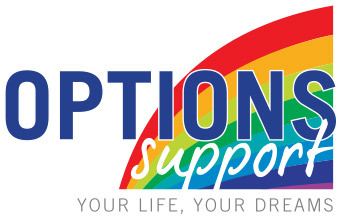 At Options, we are passionate about supporting people to achieve their goals, retain their independence and achieve their full potential. We support individuals both in their homes and out in the community, providing support from just a few hours each week, to 24 hours each day. We are looking for individuals who are hard working, good communicators, honest, forward-thinking and able to work on their own initiative. Each day will be varied and you will end the day knowing you have made a difference. Experience is not necessary as full, paid training will be provided. Full and part time positions are available, together with sleep-ins and weekend sessions. Bristol & South Gloucestershire areas. Salary : Depending on experience, qualifications and shift pattern. Double time for bank holidays, pension contribution and on-going training given.